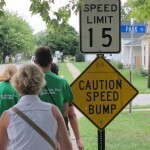 On June 24, folks from St. Paul’s hit the pavement to intentionally engage the community by walking its streets. For 12 weeks over the summer, 37 walkers covered more than 147 miles of sidewalks, trails, roads, and alleys, paying close attention to what they saw, heard, and experienced. They were looking specifically for ways at which God is already at work in the world around us. 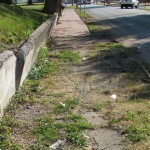 Sometimes new sidewalks the city provided easy walking, but other times the sidewalks ended or were in disrepair. Many of the neighborhoods contained a variety of single-family and multi-family homes – some needing a little TLC, but many in good condition and under great care. Near the center of the city, small businesses (a few just opening) were contained in houses amidst residential homes. Of particular interest was the old church building on John & Gentry which has since been converted into a residence. Walkers didn’t notice or interact much with others for the first few weeks when temperatures reached over 100 degrees. As the heat began to break, children emerged to play on the sidewalks and ride their bikes down side streets followed by people relaxing on their porches and working in their yards. For those who didn’t feel physically up for a walk (especially given the high heat! ), St. Paul’s partnered with the Paul Phillippe Center to provide a way for them to participate. The ride-along gave participants a way to see a lot of the city and surrounding areas, guided by a very knowledgeable driver. During the campaign, participants came up with a few more creative ways to engage the community. As a way to celebrate the conclusion of the campaign, walkers invited local food industries to join a celebratory meal on Sunday, September 23rd. The lunch featured locally produced & distributed foods from Schoup’s Country Foods, Frito-Lay, Glover’s Ice Cream, Zachary’s Candy, and Margarita’s Pupusería. 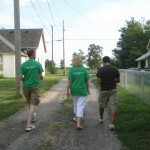 Walkers also wanted to find a way to complement our listening with a way to serve the poor. So, on August 5th, St. Paul’s began collecting shoes for the shoe-less. 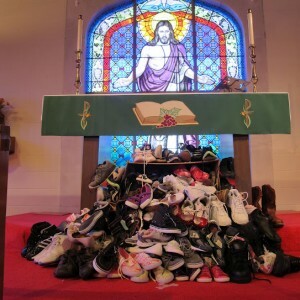 Two large boxes were placed in the narthex outside of the sanctuary and people were asked to search their closet for unused shoes or bring in a pair of new shoes. Slowly, the boxes began to fill up – and then overflow! In total, over 180 pairs of shoes were blessed and sent on their way to be distributed by Art for Humanity! Overall, the walkers’ response to the walk was one of surprising hope. We discovered a number of “leads” and “interesting guesses” about where this experience will take St. Paul’s into the future. The observations made during the walks will help give shape our future engagements, like the one-to-one listening campaign in 2013. 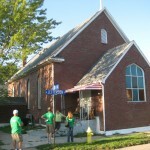 Without question, St. Paul’s is beginning to see itself as part of the community here in Clinton county; but what we’ve witnessed walking the streets, collecting shoes, and inviting neighbors to share a meal, has helped us see ourselves as part of something even larger – God’s mission in the world, active and alive in our small corner of the world. As part of St. Paul’s mission-implementing, partnership grant, members and friends of St. Paul’s are invited to join together as we “walk the community.” Through this campaign, we hope to learn more about the community in which we live, where God is already working, and how we may be a part of God’s work here, locally. There are a number of ways to participate. 1. 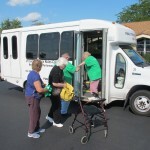 Wednesday Walks – Each Wednesday evening we will walk 1 to 2 miles of the community. Starting locations are announced each Sunday and listed in the Walking the Community brochure. 2. Ride Alongs – If walking for more than a mile sounds like too much of a physical toll, you can still participate in a ride-along on the third Wednesday of the month. 3. Walking at your own pace – For them, the Wednesday walks may not be the best time of day. Many people already are walking. So we’ve made it easy for you to walk at your own pace. All you need to do is fill out a response card that indicates who you walked with (pairs are great! and a cord with three strands is not easily broken), where you walked, and what you saw or experienced. Our goal is to have 80% of St. Paul’s participate and cover as much of the area as we can. We also hope to schedule special walks soon – some of these may include “night walks,” “walks w/ community leaders,” “walking together with other christians,” or in other areas – like Mulberry! The best way to keep up-to-date is to sign up for St. Paul’s (e)pistle and follow us on facebook. So take a second to click “like” and then lace up those shoes and come meet us out on the sidewalks!